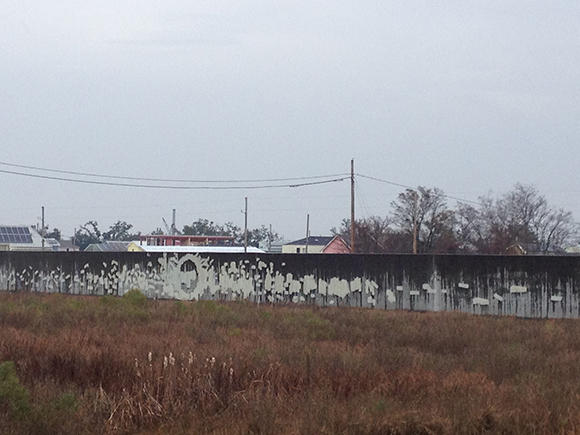 67 U.S communities will compete for funding to implement plans for “recovery, resilience, and revitalization” better than this floodwall at New Orleans’ Lower Ninth Ward. Photo by the author. Last week’s announcement by the White House of $1 billion of funding to go to communities hit by disasters signals that ‘resilience’ – still just a buzzword to some – is increasingly becoming a concept that more businesses, communities, and governments are willing to put more money behind. Fresh on the heels of U.S. Department of Housing and Urban Development’s innovative Rebuild by Design (RBD) competition, which awarded $920 million in Community Development Block Grant Disaster Recovery Assistance (CDBG-DR) funds to (surprise, surprise…) New Jersey, New York State, and New York City for six proposals, the National Disaster Resilience Competition might actually have the chance to make a real impact on more underserved communities. 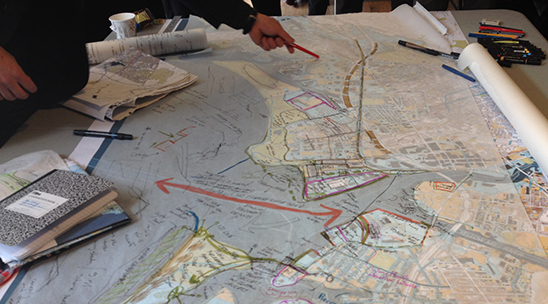 Make no small plans: from Rebuild by Design competition’s Resilient Bridgeport, CT workshop in February 2014. Photo by the author. According to the press release, “HUD will ensure that geographic diversity is a consideration in the selection of participating communities”, with $820 million to be made available to all states and local governments that experienced a Presidentially-declared major disaster in 2011, 2012, and 2013, and states in the Hurricane Sandy-affected region eligible for approximately $180 million. It will be interesting to see how municipalities in states not receptive to the goals of the initiative will handle potential entries. My home state of North Carolina, for example – a lovely agglomeration of mountains, foothills, coastal plains, and a considerable number of beaches and barrier islands such as the Outer Banks – is also a forerunner in climate change risk, having declared 5 major disasters across 62 counties from 2011-2013, primarily at coasts. Governor Pat McCrory’s state legislature, however, has already proven to be tone-deaf to climate change preparation, going down the rabbit-hole of questioning the science of global warming rather than actually taking action to insure that communities will be better prepared for whatever comes next. I predict that communities, in order to pursue this and future funding, will begin to take a partnering approach similar to the U.S. Conference of Mayors, which has continued to make strides towards the reduction of poverty and crime, economic development, and energy efficiency, even in the face of federal (and state) inaction. High hopes that putting its money where its mouth is will help the U.S. shift away from disaster relief and towards disaster risk reduction, adaptation and genuine resilience. For additional information, see the U.S. Department of Housing and Urban Development’s Fact Sheet.